Iron is one of the most common elements on earth. Nearly every construction of man contains at least a little iron. It is also one of the oldest metals and was first fashioned into useful and ornamental objects at least 3,500 years ago. Pure iron is a soft, grayish-white metal. Although iron is a common element, pure iron is almost never found in nature. The only pure iron known to exist naturally comes from fallen meteorites. Most iron is found in minerals formed by the combination of iron with other elements. Iron oxides are the most common. Those minerals near the surface of the earth that have the highest iron content are known as iron ores and are mined commercially. Iron ore is converted into various types of iron through several processes. 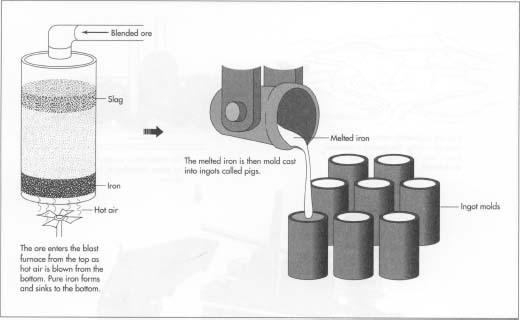 The most common process is the use of a blast furnace to produce pig iron which is about 92-94% iron and 3-5% carbon with smaller amounts of other elements. Pig iron has only limited uses, and most of this iron goes on to a steel mill where it is converted into various steel alloys by further reducing the carbon content and adding other elements such as manganese and nickel to give the steel specific properties. Historians believe that the Egyptians were the first people to work with small amounts of iron, some five or six thousand years ago. The metal they used was apparently extracted from meteorites. Evidence of what is believed to be the first example of iron mining and smelting points to the ancient Hittite culture in what is now Turkey. Because iron was a far superior material for the manufacture of weapons and tools than any other known metal, its production was a closely guarded secret. However, the basic technique was simple, and the use of iron gradually spread. As useful as it was compared to other materials, iron had disadvantages. The quality of the tools made from it was highly variable, depending on the region from which the iron ore was taken and the method used to extract the iron. The chemical nature of the changes taking place during the extraction were not understood; in particular, the importance of carbon to the metal's hardness. Practices varied widely in different parts of the world. There is evidence, for example, that the Chinese were able to melt and cast iron implements very early, and that the Japanese produced amazing results with steel in small amounts, as evidenced by heirloom swords dating back centuries. Similar breakthroughs were made in the Middle East and India, but the processes never emerged into the rest of the world. For centuries the Europeans lacked methods for heating iron to the melting point at all. To produce iron, they slowly burned iron ore with wood in a clay-lined oven. The iron separated from the surrounding rock but never quite melted. Instead, it formed a crusty slag which was removed by hammering. This repeated heating and hammering process mixed oxygen with the iron oxide to produce iron, and removed the carbon from the metal. The result was nearly pure iron, easily shaped with hammers and tongs but too soft to take and keep a good edge. Because the metal was shaped, or wrought, by hammering, it came to be called wrought iron. Tools and weapons brought back to Europe from the East were made of an iron that had been melted and cast into shape. Retaining more carbon, cast iron is harder than wrought iron and will hold a cutting edge. However, it is also more brittle than wrought iron. The European iron workers knew the Easterners had better iron, but not the processes involved in fashioning stronger iron products. Entire nations launched efforts to discover the process. The first known European breakthrough in the production of cast iron, which led quickly to the first practical steel, did not come until 1740. In that year, Benjamin Huntsman took out a patent for the melting of material for the production of steel springs to be used in clockmaking. Over the next 20 years or so, the procedure became more widely adopted. Huntsman used a blast furnace to melt wrought iron in a clay crucible. He then added carefully measured amounts of pure charcoal to the melted metal. The resulting alloy was both strong and flexible when cast into springs. Since Huntsman was originally interested only in making better clocks, his crucible steel led directly to the development of nautical chronometers, which, in turn, made global navigation possible by allowing mariners to precisely determine their east/west position. The fact that he had also invented modern metallurgy was a side-effect which he apparently failed to notice. The raw materials used to produce pig iron in a blast furnace are iron ore, coke, sinter, and limestone. Iron ores are mainly iron oxides and include magnetite, hematite, limonite, and many other rocks. The iron content of these ores ranges from 70% down to 20% or less. Coke is a substance made by heating coal until it becomes almost pure carbon. Sinter is made of lesser grade, finely divided iron ore which, is roasted with coke and lime to remove a large amount of the impurities in the ore. Limestone occurs naturally and is a source of calcium carbonate. Other metals are sometimes mixed with iron in the production of various forms of steel, such as chromium, nickel, manganese, molybdenum, and tungsten. Before iron ore can be used in a blast furnace, it must be extracted from the ground and partially refined to remove most of the impurities. Historically, iron was produced by the hot-blast method, or later, the anthracite furnace. Either way, the fundamental activity in iron making involved a worker stirring small batches of pig iron and cinder until the iron separated from the slag. Called "puddling," this was highly skilled work, but was also hot, strenuous, and dangerous. It required a lot of experience as well as a hearty constitution. Puddlers were proud, independent, and highly paid. 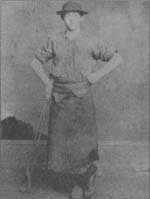 Puddlers founded the first trade union in the iron and steel industry, the Sons of Vulcan, in Pittsburgh in 1858. In 1876, this union merged with three other labor organizations to form the Amalgamated Association of Iron and Steel Workers. This was the union that Andrew Carnegie defeated in the Homestead Strike of 1892, leaving the union in shambles and the industry essentially unorganized until the 1930s. Pure iron is a soft, grayish-white metal. Although iron is a common element, pure iron is almost never found in nature. Minerals near the surface of the earth that have the highest iron content are known as iron ores and are mined commercially. surface of the ground is removed by heavy machines, often over a very large area, to expose the ore beneath. In cases where it is not economical to remove the surface, shafts are dug into the earth, with side tunnels to follow the layer of ore.
2 The mined ore is crushed and sorted. The best grades of ore contain over 60% iron. 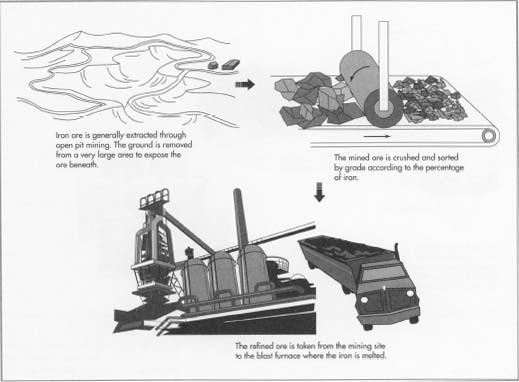 Lesser grades are treated, or refined, to remove various contaminants before the ore is shipped to the blast furnace. Collectively, these refining methods are called beneficiation and include further crushing, washing with water to float sand and clay away, magnetic separation, pelletizing, and sintering. As more of the world's known supply of high iron content ore is depleted, these refining techniques have become increasingly important. 3 The refined ore is then loaded on trains or ships and transported to the blast furnace site. then reacts with the iron ore to form carbon dioxide and pure iron. 2 The melted iron sinks to the bottom of the furnace. The limestone combines with the rock and other impurities in the ore to form a slag which is lighter than the iron and floats on top. As the volume of the charge is reduced, more is continually added at the top of the furnace. The iron and slag are drawn off separately from the bottom of the furnace. The melted iron might go to a further alloying process, or might be cast into ingots called pigs. The slag is carried away for disposal. 3 The hot gases produced in the chemical reactions are drawn off at the top and routed to a gas cleaning plant where they are cleaned, or scrubbed, and sent back into the furnace; the remaining carbon monoxide, in particular, is useful to the chemical reactions going on within the furnace. A blast furnace normally runs day and night for several years. Eventually the brick lining begins to crumble, and the furnace is then shut down for maintenance. The blast furnace operation is highly instrumented and is monitored continuously. Times and temperatures are checked and recorded. The chemical content of the iron ores received from the various mines are checked, and the ore is blended with other iron ore to achieve the desired charge. Samples are taken from each pour and checked for chemical content and mechanical properties such as strength and hardness. There are a great many possible environmental effects from the iron industry. The first and most obvious is the process of open pit mining. Huge tracts of land are stripped to bare rock. Today, depleted mining sites are commonly used as landfills, then covered over and landscaped. Some of these landfills themselves become environmental problems, since in the recent past, some were used for the disposal of highly toxic substances which leached into soil and water. A byproduct of iron purification is slag, which is produced in huge amounts. This material is largely inert, but must still be disposed of in landfills. Ironmaking uses up huge amounts of coal. The coal is not used directly, but is first reduced to coke which consists of almost pure carbon. The many chemical byproducts of coking are almost all toxic, but they are also commercially useful. These products include ammonia, which is used in a vast number of products; phenol, which is used to make plastics, cutting oils, and antiseptics; cresols, which go into herbicides, pesticides, pharmaceuticals, and photographic chemicals; and toluene, which is an ingredient in many complex chemical products such as solvents and explosives. On the surface, the future of iron production—especially in the United States—appears troubled. Reserves of high-quality ore have become considerably depleted in areas where it can be economically extracted. Many long-time steel mills have closed. However, these appearances are deceiving. New ore-enrichment techniques have made the use of lower-grade ore much more attractive, and there is a vast supply of that ore. Many steel plants have closed in recent decades, but this is largely because fewer are needed. The efficiency of blast furnaces alone has improved remarkably. At the beginning of this century, the largest blast furnace in the United States produced 644 tons of pig iron a day. It is believed that soon the possible production of a single furnace will reach 4,000 tons per day. Since many of these more modern plants have been built overseas, it has actually become more economical in some cases to ship steel across the ocean than to produce it in older U.S. plants. Lambert, Mark. Spotlight on Iron and Steel. Rourke Enterprises, 1988. Hartley, Edward N. Iron and Steel Works of the World. International Publication, 1987. Lewis, W. David. Iron and Steel in America. Hagley Museum, 1986. Walker, R. D. Modern Ironmaking Methods. Gower Publication, 1986. What is the difference between iron we use for construction and the iron we use for iron deficiency in diets? how pharma industries manufacture their iron supplements?